Our Iron-Clad Money Back Guarantee is what you’ll get when you buy any qualifying Certified car, truck, van or SUV from Frank Myers Auto Maxx. Remember that car you bought and regretted it the next morning? What did you do? If you’re like most people, the only thing that you could do was get sick on your stomach! Well, there’s no need to worry about ever making a mistake when buying a qualifying Certified vehicle from Frank Myers Auto Maxx because of our FREE Iron-Clad Money Back Guarantee! • Wrong color? Bring it back! • Won’t fit in the garage? Bring it back! • Funky smell coming out of the vents? Bring it back! • Found a better deal at another dealership? Highly unlikely but you can still BRING IT BACK! You can return your qualifying Certified vehicle for any reason! And Uncle Frank won’t pressure you into buying another vehicle or keeping the one that you bought. Simply bring it back in the same condition in which it was purchased, and you will get a refund. For more information about this risk free program, call any of of our Team Members at 866-242-1277. They are always eager and willing to assist you. Or you can click HERE to read the fine print. • The vehicle must be a qualifying Certified vehicle. 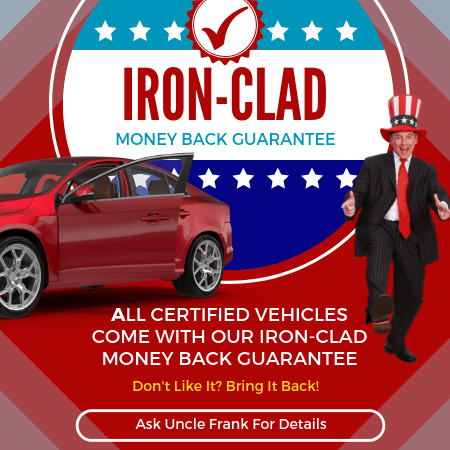 Non-Certified vehicles do not qualify for the Iron-Clad Money Back Guarantee. • Less than 300 miles must have been driven since time of purchase. • There is no damage to the vehicle (i.e. – body or glass or interior). • In the opinion of the selling dealer, the vehicle has not been abused. • If there is a trade involved, it will be returned unless it has been sold. If it has been sold, you will be refunded the wholesale value of the vehicle. If it hasn’t been sold but has had monies spent on it for reconditioning, this amount will be deducted from the refund. • You have had the vehicle for less than 2 business days. • Any monies still due, any bank fees (if applicable) and tax/tag and nonrefundable title documentary fees will be deducted from the refund. If there is no refund due the customer at time of return, any bank fees (if applicable) and tax/tag and nonrefundable title documentary fees must be paid in full before the return will be accepted. • Any expenses you may have incurred will not be refunded. This includes charges for items installed or added to the vehicle or any gas purchased. • This refund policy applies to the vehicle(s) listed on the Retail Purchase Agreement and is not assignable to a third party.